Recognise typical op amp packages. Recognise typical pin functions on op amps. 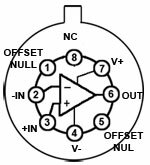 Op amps, like any amplifier circuit, can be built from discrete components, i.e. 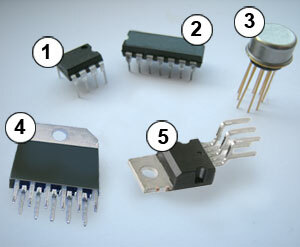 resistors, capacitors and transistors, or even using valves (tubes). However, op amp integrated circuits are available in many different types and packages, which considerably reduce the component count in discrete circuits. Some examples of IC op-amps are shown in Fig. 6.5.1. Manufacturers offer ranges of both BJT and CMOS amplifiers, as well as comparators, that can be incorporated into many electronics systems using a minimum of external components, the greater the degree of integration the more design complexity and cost is reduced. 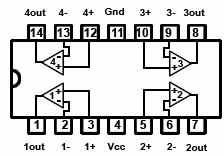 Many op-amp ICs are also avaliable in surface mount format, giving great reductions in circuit size and also allowing for automated assembly. Further integration has produced Application Specific Integrated Circuits (ASICS) where op amp technology has been combined with other circuit elements within a single IC designed to carry out a specific circuit function within a particular dedicated application such as a TV receiver or a cell phone. The TLC271 from Texas Instruments is a programmable op amp in an 8pin DIL (Dual In Line) package, (other package types available) which offers a range of programmable power consumption modes, selected by the level of voltage applied to the bias select pin. National Semiconductor LMC660CN quad CMOS operational amplifier offers 4 op amps in a single package that uses a single voltage power supply of between 5V and 15V. See the LMC660 datasheet from Texas Instruments for additional features. The 741 op amp has been a very popular design since its introduction by Signetics (now part of Philips NXP Semiconductors) in the 1960s. Today, it is available from a number of manufacturers (including Texas Instruments) in several different versions and in a variety of package designs including the 8 pin DIL package. 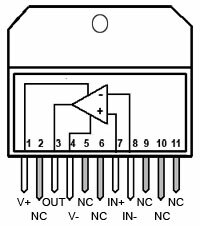 The illustration shows it in an eight lead TO5-8 package, and although the 741 has been superseded in many respects by more modern designs, it remains a good general purpose op amp. The LM3875 from National Semiconductor is a high-performance audio power amplifier in a single integrated circuit, capable of delivering 56W of continuous average power to an 8O load with 0.1% total harmonic distortion and noise within the 20Hz to 20kHz audio range. All this in a TA11B 11 pin package less than 1 inch square. The TDA2003A from ST Microelectronics is a high performance audio amplifier designed for car radios. This 10watt amplifier will deliver an output current of 3.5A and uses a power supply of up to 18V DC. The 5 pin Pentawatt package offers savings in space and cost, requiring only a few external components.